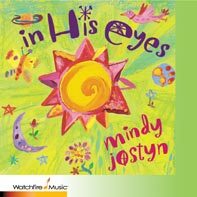 In His Eyes is a wonderful collection of 16 non-denominational folk hymns. Produced by Mindy and Matt Balitsaris it’s flavored with musical influences from around the world and features Mindy’s expressive vocals and her command of violin, accordion, keyboard, guitar and harmonica. Copyright ( 1998 Say No More Publishing (BMI) & Maya Productions Ltd. Copyright ( 1998 Say No More Publishing (BMI) & Maya Productions Ltd. (ASCAP). All Rights Reserved. But who is more blessed than I am? Copyright ( 2005 Say No More Publishing (BMI) & Maya Productions Ltd. Copyright ( 2005 Say No More Publishing (BMI) & Maya Productions Ltd. (ASCAP). All Rights Reserved. I need not plead, For You abide with me.